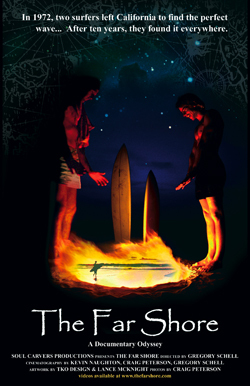 A documentary film by Gregory Schell, featuring the surf travel misadventures of Kevin Naughton and Craig Peterson. For ten years they scoured the planet in search of perfect waves. Featuring an original soundtrack, classic photos and super 8 footage from California, Mexico, El Salvador, Costa Rica, Africa, Morocco, Ireland, France and Fiji. A great present! Your order arrives within 5-7 U.S. Mail days. Price does not yet include shipping and tax which will be reflected at checkout. - Please allow 5-7 days delivery for domestic, 2-3 weeks for intl. If you have any special requests please email us. To contact the director Gregory Schell click here.